Everything that has emerged on Dez Bryant Wal-Mart incident since Friday is consistent with everything I've heard since November. Yesterday it was pointed out to me that this IS the same guy who put his hands on his own mother. So. No arrest was made, and it seems like the young lady (who was seen being DRAGGED!?) said that nothing happened. What seems to be the case here, is that the video tells a different story. From my understanding, several media outlets have screenshots from the video, so it definitely exists. However, they aren’t putting it out there because they don’t want to face a lawsuit (at least that’s what one said yesterday). Police report throws no wrong-doing on Dez Bryant. But many close to Dez says there is a video. That's why this situation is complicated. Media outlets are contacting their legal teams, and from what I understand there is currently a bidding war going on for this video…one which includes Dez Bryant’s camp. The thing about it is that no matter WHO gets their hands on this video, (1) it’s already out there now, (2) there are definitely copies and (3) it IS going to leak. It may not be today or tomorrow or next week, but we WILL see that video. The bottom line is that it seems like Dez needs to do better, MUCH better, with the company he keeps. It seems as if that’s a concern of the Cowboys franchise as well. Hope it’s not as bad as they say it is. Cause if so. Whew. 1. So Liv speaks Farsi. K! 2. Abby still trying to be on the inside. Sis. Nobody is really here for you. 3. I need Andrew to die. Amnesty? Really? Ugh. 4. “This is as high as you go, Andrew. Go any higher, and you get shot down.” <— Talk your ish, Mellie! 5. The Director of the CIA is trying to get Fitz to see that this whole Olivia Pope thing is not looking good and he’s just like, “EH. Extract.” Willing to go to war with…everybody…to get Liv home. Sheesh. 6. LOOK AT CYRUS SPAZZING OUT ON FITZ! “You moron!” BWAHAHAHAHA! He’s fed up. Oh. It was a daydream. LMAO. He’s gonna have a stoke, guys. 7. Jake told Huck the truth. He’s got to stop depending on Liv and learn to control himself. “Depends on what ya got to say bish!” <– Huck’s answer in my head. 9. OH WAIT! Elizabeth is wanting to solicit Huck’s services for Andrew!? WAIIIIIIT! Huck said no!?!? NO NO NO NO! Don’t tame yourself right now!!!!!!!! 10. Cyrus! He’s going behind the president’s back!? 11. Oh look. Abby is finally catching on. Just go tell Fitz!!!!! 14. Abby still should’ve told what she knew right there in front of Cyrus. Chile please. Cyrus ain’t punkin nobody! And OMG I need Fitz to be able to discern better! Lawd. Jake done said his daughter has been kidnapped and auctioned off and he’s talking about fishing! HALP. 16. “I don’t have a daughter.” <— Well, I mean she DID try to kill him. Twice. 18. Abby bout to get shot. Lawd. 19. YASSSSSSSSSSSSSSSSSSSSSSSSSSSSSSSSSSSSSSSSSSSSSSSSSSSSSSSSS LIVVVVVVVVVVVVV!!!!! BEAT THA SHYT OUT OF HIM!!! OLE PUNK BISH THINK HE WAS RUNNING ISH! OUT HERE PLAYING WITH THE ADULTS WHILE SITTING AT THE KIDS’ TABLE!!!! YASSSSS!!!!!! Stephen Finch. Used to be a gladiator! WHEW Liv! 20. Oh look! Abby! She came through! But while she’s sitting here talking to Cyrus, she should be going clear across his face with that bottle. 21. “You brought this on yourself.” <- Yes ma’am, Mellie. 22. Liv got bout 15 locks on her door. But I don’t blame her. I’d do the same. 24. Wait. Um Fitz. She was just kidnapped. Don’t grab her like that. Kinda traumatic. “You didn’t save me! I’m on my own.” <— Well, that’s not entirely true, Liv. But whatever. Okay. So that’s that. Sorry so late, guys. But here it is! Lady Gaga + American Horror Story = YES PLEASE. As we all know, unfortunately, American Horror Story: Freak Show was the last season we’ll see with Jessica Lange. So as you see, this season’s theme is “Hotel.” I’m ready. I have NO DOUBT this will help fill that void (I hope). Shame on you, NCAA, for your treatment of Silas Nacita. Disgusting. Silas Nacita. This young man has an AMAZING story, and was profiled by the Waco Tribune in November 2014. 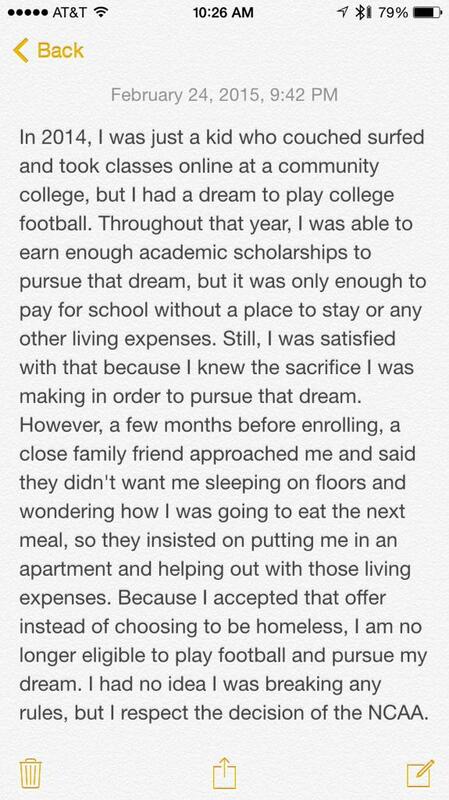 Here’s a piece of his story, however, I’d encourage you to go read it all. 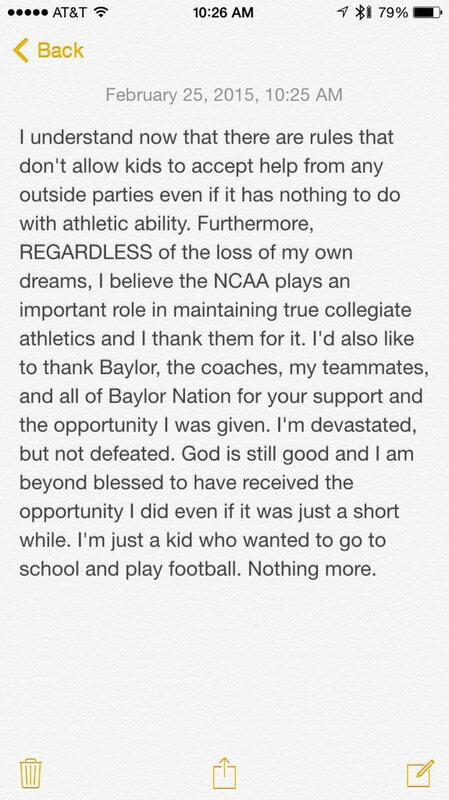 Nacita decided to transfer to Baylor and came out for preseason drills in August of 2013. But he found out he didn’t have enough financial aid to enroll at Baylor, and ended up taking online classes at McLennan Community College last fall and spring. Once again, he began couch surfing at friends’ apartments. He even slept under a tree one night at Cameron Park. Determined to get another shot to play football for Baylor, Nacita began writing down his goals every day. Nacita said he earned a 4.0 GPA during his two semesters at MCC and got his financial aid in order to guarantee that he would have enough money to attend Baylor. One of the most difficult tasks for Nacita was staying in good enough condition to be ready for preseason drills at Baylor in August. He came up with some creative ways to stay in shape. Though older brother Isaac Nacita didn’t know the full extent of Silas’ living conditions, he began to learn more as the year progressed. Back for preseason drills, Nacita impressed the Baylor coaching staff and his teammates with his work ethic and determined style of running. Though he’s Baylor’s fourth running back behind Linwood, Chafin and Jefferson, he practices like he’s going to start every game. Chafin said Nacita’s upbeat attitude is refreshing and he keeps teammates loose with his humor and different perspective on life. After making some impressive runs during an August scrimmage, Nacita picked up the nickname: Salsa Nacho. Following his first touchdown run against SMU, Nacita rushed for 104 yards and scored two more touchdowns in the fourth quarter of Baylor’s 70-6 win over Northwestern State in the second game of the season. During Big 12 games, Nacita has made his mark on special teams. Baylor running backs coach Jeff Lebby believes Nacita could be the featured back on many teams. Nacita hopes to eventually earn an athletic scholarship at Baylor instead of relying on academic scholarships and financial aid. He doesn’t know yet what he wants to do after college, but he plans to go into a profession where he can help people. Well, this story just popped up on my timeline (Twitter) and it broke my heart. I am almost in tears. This is just as unbelievable as it is disgusting and unfair. This is a TERRIBLE look for the NCAA and they must be stopped. I find myself asking, “What can we do?” … but I come up short. And not just because of this case, but because college athletes are constantly getting treated unfairly by the NCAA. Salute to Mr. Nacita for the class in his statement. 2 My brethren, count it all joy when you fall into various trials, 3 knowing that the testing of your faith produces patience. The NCAA did not declare Silas Nacita ineligible and Baylor has not requested a waiver for him. I saw some more information on this and wanted to give an update. After the Bleacher Report article hit and news of my ineligibility broke, just about every top NAIA program called me and immediately expressed interest. Places in Iowa, Oregon, Kansas, Oklahoma, Nebraska—there had to be at least 10 programs that called. It felt good to be wanted. I wasn’t recruited to Baylor and I was always ‘just a walk-on’ there, but at this point, I’m way past the recruiting phase. I’ve gone through so much, now it’s all about just playing football. I narrowed it down to two schools: Faulkner University in Alabama and Southwestern Assemblies of God University in Waxahachie, Texas—right up the road. In the NAIA they can’t do official visits and offer flights, so I really wasn’t able to visit any of the schools that called other than SAGU. I didn’t want to commit to a school without seeing it. I also know how important community is, so I didn’t want to agree to play somewhere blind. I visit SAGU twice. The first time I went to their spring game, coming from Baylor. I knew anywhere I went there would be a major drop off in facilities, but it was shocking how small it was. I had just come from a new $280 million stadium and they were playing at a rec field in the back. Even with that considered, the guys I watched were fired up. They were having fun. They were talking smack. It was football. After the spring game, I drove up the following Thursday with the head coach, Frank Tristan, who offered to come pick me up. We talked the whole ride about what had gone on and faith. That man is not just interested in coaching; he’s teaching kids about life. That was important for me. He seems like a great coach and a man of God. When we arrived at the school, he gave me a tour of campus. My high school was bigger. They told me that I would be a big part of the team next year and were all very excited to have me. It’s different from where I am came from, but they made me feel wanted and it was close to where I wanted to be. I was sold. A big part of the reason I decided to transfer up the road to SAGU is because it’s only 50 minutes away from Baylor. I can visit often, and that’s still the plan. That’s important to me. I am already planning to come back during one of the bye weeks to catch a game to support my teammates. I know that I won’t be a student or athlete any longer and that my access will be limited. But there are people I care about here. I’m finishing the semester strong with As and Bs. My last final is Saturday. That will be my last day as a Bear. It’s tough and sad. This is where I always wanted to be. This is the team I dreamed of for so long. This community, the coaching staff, my teammates and everything about the school was amazing. This was the pinnacle of everything I worked for, so of course it’s going to be hard to leave. At least I’ll be leaving with a keepsake—a Big 12 Championship ring. To be honest, I wasn’t sure I would get one. It also feels better knowing that my friend, Wyatt Schrepfer, will get the same opportunity I once did. Wyatt came from Colorado School of Mines wanting to play at a bigger program. The day I found out I was off the team was the day he found out he was on it. I essentially gave him my spot, and I couldn’t be happier for him. As one of my final farewells, we delivered pizzas to the library, together. The plan is to head back to California once finals are done, where the journey began. NAIA is a lot less rigorous and we’re not required to be out here for the summer. Most of the guys go home, so I’m going back to train and hopefully get a job. I’ll be living with my mom back in California. I’m excited because I haven’t seen her in some time. I think in the past four years we’ve spent maybe a month or two together total. She sacrificed so much when I was younger and I know we really didn’t get along. But I want to give back. She’s been so critical of how she raised us—raising four kids by herself. She did a wonderful job. Other than being in Waco training, there is no better option. Once I get home, I need to be training. If I were in Waco, I’d be working out two or three hours a day. I want to do that same on my own. I’m not sure what job I will pick up. It doesn’t matter to me, as long as I am staying in shape and one step closer to my next goal. If I have to, I’ll go work at Chipotle. I’m ready. After I committed to SAGU, I picked up my journal for the first time in a long time. I had been writing “2014 Baylor Playmaker” or “2015 Baylor Playmaker” as my goals since 2013, but after I found out I was ineligible, I didn’t know what to write. I didn’t know what to say. I let it go and stopped writing altogether. I lost it, at least temporarily. A happy, although bittersweet, ending to what was seemingly a career-ending decision. “Family First: The Marshawn Lynch Story” traces the Lynch’s rise from Oakland to the NFL. An actor, Demarea Davis, portrays Lynch in middle school. Davonte Lynch, Lynch’s younger brother, plays him in high school. And Lynch takes over starting with his years while at Cal.